Taken as a whole, non-producer interests have become increasingly visible at the European level over the past decade, and undoubtedly play a greater role in European public affairs than was the case only a decade ago. Difficulty in ratifying the TEU in the member states was widely attributed to the remoteness of the European agenda from European citizens. 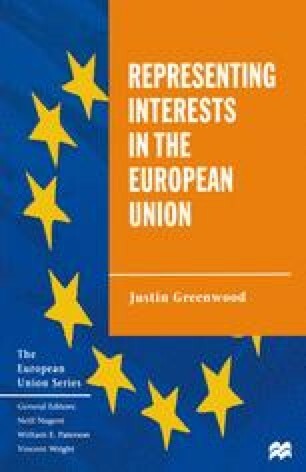 ‘Democratic deficit’ (Chapter 1) has been a major concern throughout European politics in recent years, and a context for public interest politics to develop. It has been consistently used by the Parliament as a basis to claim further powers in European policy-making. The Commission and the Council have vied with one another to demonstrate their democratic credentials, and have sought to establish mechanisms for openness and transparency in decision-making (Chapter 2). In particular, the Commission, the most vulnerable of these institutions to the charge of remoteness, has engaged in a wide-ranging programme to explain the benefits of EU membership to citizens.